It is my hope that women find the cards simple to use and fun to learn, and that in time, women understand their own body changes during their cycles! Keep the knowledge flowing, there are many applications and discoveries for the use of MyMoonCards for a global community of women who KNOW. Born to teach the complex changes of women's bodies during the menstrual cycle years, one day at a time. Marina is a Registered Nurse with a Bachelor in Health Science from Antioch University in Santa Barbara and a Nurse Practitioner Certified as a Women’s Health Care Specialist from the University of Southern California Long Beach. She is also a Certified Nurse Midwife with a Masters of Science in Midwifery Leadership from the University of California in San Francisco. She has been a provider of holistic health care since the 70's in community clinics and in her midwifery practice. Marina is an international speaker, her focus is the development and implementation of women’s centered health care and services. Puberty, menstruation, ovulation, conception, childbirth, and menopause are all part of a woman's cycle. That is why many call our cycle a mystery. It is a riddle that in time led Marina Alzugaray to try and unravel the secrets of her own cycle, for her own life and to teach other women about it, a journey that she just recently completed with the creation of MyMoonCards. 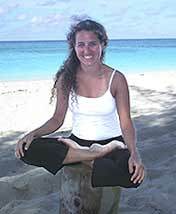 Marina Alzugaray developed MyMoonCards to make the woman's cycle easy to understand, a wish that had been building in her during 30 years of working with women of all ages as a reproductive health care specialist, holistic practitioner and teacher of women's body awareness and birth wellness. How can education awaken and nurture women’s knowhow about their body & cycles? Marina thought. How can cycle information be shared easily for any woman to utilize? The wish to share information about normal body changes during the cycles united with the desire to facilitate women's health and wellness to create MyMoonCards. It happened in 2003 when Marina was working with teens in the Florida Keys. Women continued to have similar needs and questions that reconnected Marina again with women, especially teens, unmet need to understand their changes. Marina wrote up the invention and filled the patent documents by 2/2/05. ‘I would like to give my deepest thanks to all who contributed during the labor’. Maria Luther encouraged, typed and then tested the prototype while cousin Julie provided the start up cost. GroAnnie Adelman and Elizabeth Davis checked the text, then the cards were beta tested in 2005. The last push came with Barbara Wolf when she readied the insert, then G Howard did the type set, Steve began the web-page, Delanoservice the printing and the first set of MyMoonCards arrived. Marina sent the announcement a few days later. Maria is a certified Elementary Educator with a B.S. in Psychology from Birmingham Southern College. She is also a certified Yoga Instructor and teaches yoga classes. For over 15 years, Maria has worked passionately and creatively towards empowering young people through her easy-going acceptance, child like exuberance and creative activities. She has directed summer camps and an outdoor environmental education center. She now teaches fifth grade in the Florida Keys. Maria promotes health education in schools, with a focus on nutrition, body awareness and emotional well-being. Maria and Marina met in a bellydance class. They began working together after sharing ideas about holding Mother/Daughter Retreats to celebrate the passage into womanhood. Maria has been studying her cycle with MyMoonCards since 2004. Maria and Marina met in a bellydance class in the Florida Keys. Sharing ideas about bringing Mothers and Daughters together to celebrate the passage into womanhood brought Maria to work with Marina on MyMoonCards. Maria has been studying her cycle with MyMoonCards since 2004. Please let us know how the cards serve you, your daughters, and your community. Click here for feedback.